We’ll provide some insights and review some of our value DFS defense picks for week 6. Dallas Cowboys – Salaries: DraftKings (DK) – 2300, FanDuel (FD) – 4100. The Cowboys’ salary ranks them 19th/10th on DK/FD, respectively, making them a better relative value on DK. The betting lines with the Jaguars has the game total at 40.5 points (lowest on the board) with the Cowboys as +3 point home dogs. The Jaguars’ implied team total is currently at 21.75 points and the Cowboys are currently at 18.75 points. Against the Jaguars last week, the Chiefs’ defense logged 5 sacks, 4 picks with one getting returned for a TD, and a fumble recovery, finishing as the #1 (tied) fantasy defense with 22 points. The Jaguars’ offense leads the league in giveaways with 12, while the Cowboys’ defense ranks 31st in takeaways with 4. The Jaguars rank 9th in yards per game with 404.4, rank 26th in points scored with 20.4, and give up the 5th most fantasy points to opposing defenses. The Cowboys’ defense ranks 8th in yards allowed per game with 337.4 and rank 5th in points allowed with 19.2. The Cowboys’ defense also rank 6th (tied) in sacks with 15 and QB hits with 33, while the Jaguars are a middling unit in sacks allowed with 11. DT David Irving’s return from suspension should further bolster the Cowboys’ D-line. This is setting up as an ugly, defensive type of scenario. Maybe Bad Bortles shows up and spikes a ball off of one of his O-lineman’s helmet again this week. 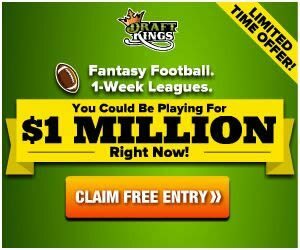 Seattle Seahawks – Salaries: DraftKings (DK) – 2600, FanDuel (FD) – 3500. The Seahawks’ salary ranks them 11th/14th on DK/FD, respectively. The betting lines with the Raiders has the game total at 48 points with the Seahawks as -3 point favorites in London. The Raiders’ implied team total is currently at 22.5 points and the Seahawks are currently at 25.5 points. Against the Raiders last week, the Chargers’ defense logged 3 sacks, a pick, a fumble recovery, and held Oakland to 10 points, finishing with 11 fantasy points. The Raiders’ offense ranks 22nd in points per game with 21.4 and 6th in total yards per game with 411.2. The Seahawks’ defense ranks 13th in both points allowed and total yards allowed per game with 22.8 and 355, respectively. The Raiders rank 21st in fantasy points allowed to defenses. The Seahawks’ defense ranks 2nd in interceptions with 9, while QB Derek Carr leads the league in interceptions thrown with 8. The Seahawks’ defense also ranks 4th in fantasy points allowed to QBs. The Seahawks’ defense recorded 1 sack and 2 picks against the Rams last week. If the positive game script holds, the Seahawks’ defense gets a favorable matchup. Los Angeles Chargers – Salaries: DraftKings (DK) – 2700, FanDuel (FD) – 4300. The Chargers’ salary ranks them 10th/6th on DK/FD, respectively. The betting lines with the Browns has the game total at 45 points with the Chargers as -1 point road favorites. The Browns’ implied team total is currently at 21.75 points and the Chargers are currently at 22.75 points. At Cleveland last week, the Ravens’ defense recorded 5 sacks, a pick, and held the Browns to 12 points. The Browns’ offense ranks 20th in points per game and 16th in yards per game at 22.8 and 376, respectively. The Chargers’ defense ranks 21st (tied) in points allowed and 15th in yards allowed per game with 26 and 365.8, respectively. The Browns rank 24th against defenses in fantasy points allowed. The Browns also give up the 2nd most sacks with 21, while the Chargers rank 19th (tied) in sacks with 11. The Chargers’ defense logged 3 sacks, 1 pick, a fumble recovery, and held the Raiders to 10 points, finishing with 11 fantasy points last week. This matchup could end up as a defensive-centric type of game. Early line movement dropped the game total by 1.5 points. Baltimore Ravens – Salaries: DraftKings (DK) – 2800, FanDuel (FD) – 4000. The Ravens’ salary ranks them 9th/11th on DK/FD, respectively. The betting lines with the Titans has the game total at 41 points (2nd lowest on the board) with the Ravens as -3 point road favorites. The Titans’ implied team total is currently at 19 points and the Ravens are currently at 22 points. Against the Titans last week, the Bills’ defense recorded 2 sacks, 1 interception, 2 fumble recoveries, and held Tennessee to 12 points to finish with 12 fantasy points. The Titans’ offense ranks 29th in both scoring and yards per game with 17.4 and 294, respectively. The Ravens’ defense ranks 1st in points allowed and 3rd in yards allowed with 15.4 and 303.8, respectively. The Titans rank 18th against defenses in fantasy points allowed. The Ravens also rank 6th (tied) in sacks with 15 while the Titans give up the 7th (tied) fewest sacks with 9. The Ravens’ defense allows the 2nd fewest fantasy points to offenses. At Cleveland, the Ravens’ defense logged 5 sacks, 1 pick, and held the Browns to 12 points, finishing with 11 fantasy points last week. The Ravens’ defense gets a solid matchup across the board against the Titans’ offense, and should look to bounce back after last week’s loss to Cleveland.